LeftClick is a leading provider of customer-focussed web design & optimisation services for e-business and is based in Christchurch, NZ. LeftClick has worked with companies such as Kathmandu, PayGlobal, NZ Tax Refunds, Sucklings, Munns Menswear, Adventure Travel, Haka Tours, House of Travel - plus more fantastic businesses - to generate staggering increases in sales and operational efficiencies. On behalf of its clients, LeftClick’s key objectives revolve around attracting better prospect traffic and converting these visitors into loyal and happy customers. LeftClick’s solutions are based on smart measurement and analysis; effective optimisation processes; business-outcome focused design; and years of experience. In working with a wide range of companies from many different industries, LeftClick has built up in-depth experience in what makes a business website perform at its best. So if you are looking to grow your business online, call either Ian Thomas or Alan Cox on 03 379 8981 to discuss how LeftClick can help. 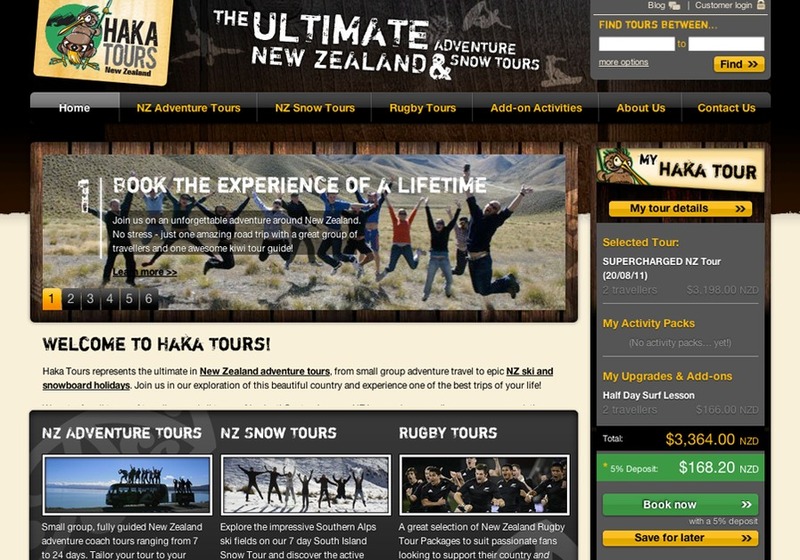 This is a screenshot of our latest tourism redesign of hakatours.com. It's been a great success, more trafic and more sales and very happy client!